® SG Special USA, début des 60's. PICKGUARD pour LES PAUL GIBSON. Importé des USA (All Parts) - PG-0802-028. LP deLuxe Cream Pickguard Left Handed. PICKGUARD pour LES PAUL GIBSON. ® DeLuxe Gaucher. CALES sous MICRO P-90 DOG EAR pour LP SG GIBSON. 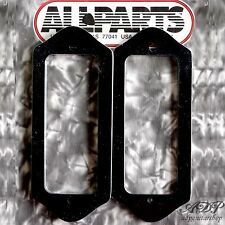 All Parts PC-0870-023 - SPACER go under P-90 DOG EAR pickup. (® Style Dog Ear Single Coil pickup). 1 jeu de 2 x CACHES-MICRO Nickel "DOG EAR" DECALES pour P-90. ®, with ears. 7/16" x 3/16". Bridge E to E, center to center is 50mm. Neck E to E, center to center is 48mm. (® Style Dog Ear Single Coil pickup). 1 jeu de 2 x CACHES-MICRO NOIR "DOG EAR" DECALES pour P-90. ®, with ears. 7/16" x 3/16". Bridge E to E, center to center is 50mm. Neck E to E, center to center is 48mm. Cream Cover Pickup for P-90 (Gibson. ). (® Style Dog Ear Single Coil pickup). Cream plastic pickup cover set for P-90. LEFT HAND GIBSON FLYING V STYLE SOLID BODY. DRILLED FOR HIP SHOT HARD TAIL BRIDGE. REAR WOOD COVER. THE BODY YOU SEE IS THE ONE YOU GET. I CUT THESE BODIES IN NEW YORK. Condition - New MADE IN THE USA. PICKGUARD BLACK pour GIBSON. 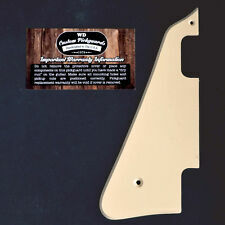 This pickguard will only fit genuine Gibson. This pickguard will not fit Epiphone. ® ES-125 T with one dogear P-90 pickup, '56-'69. For Gibson. Black Cover Pickup for P-90 (Gibson. ). 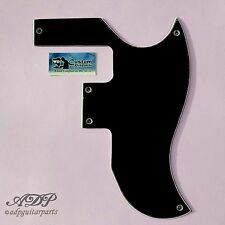 2 x Black Cover Pickup for P-90 (Gibson. ® Style Dog Ear Single Coil pickup). Authentic Gibson P-90/P-100 Dog Ear Pickup Cover in Black. Speaker Cabinets. Bose Personal Audio. Audio Interfaces. Live Vocal FX. Guitar Amplifiers. Electric Guitars. Bass Guitars. Gibson USA Les Paul. Length - 38.5 (1.515"). Vintage Gibson P-90 Pickup couvre Noir Soapbar UC 452 B"
Original vintage Gibson black soapbar P-90 pickup covers. Perfect for your custom project build or putting an old Gibbo back to period correct originality. Will ship tracked and signed for ASAP. Thanks! Cream Cover Pickup for P-90 (Gibson. ® Style Dog Ear Single Coil pickup). Speaker Cabinets. Bose Personal Audio. Audio Interfaces. Live Vocal FX. Drum Sticks. Guitar Amplifiers. Electric Guitars. Bass Guitars. 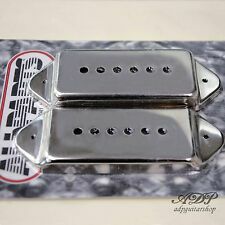 Authentic Gibson P-90 / P-100 Soapbar Pickup Cover in Black. Speaker Cabinets. Bose Personal Audio. Audio Interfaces. Live Vocal FX. Guitar Amplifiers. Electric Guitars. Bass Guitars. The discolouration colour is very accurate for that aged look and is not over done. Guitars Electric co uk. Regards, Les & Pat at Guitars Electric. Guitares électriques co uk. Toute commande d'une valeur de plus internation £ 25 ne sera envoyé par le service chenilles Internation pour la sécurité. La couleur de la décoloration est très précis pour cette aspect vieilli et ne est pas plus fait. Toute commande d'une valeur de plus internation £ 25 ne sera envoyé par le service chenilles Internation pour la sécurité. La couleur de la décoloration est très précis pour cette aspect vieilli et ne est pas plus fait. The discolouration colour is very accurate for that aged look and is not over done. Guitars Electric co uk. It achieves nothing. Regards, Les & Pat at Guitars Electric. 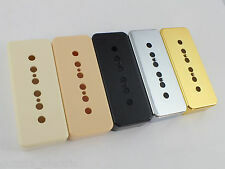 (4) Gold finish soapbar pickup mounting screws. 1-1/2" length. The discolouration colour is very accurate for that aged look and is not over done. Overall length from 'Dog Ear' ends 118mm. Mounting Screw Holes distance 97mm. Outer Pole spacing 50mm. It achieves nothing. Sinlge ply Cream, cut with straight edge, satin worn finish (see photo 5). Neck P90 recess 35.25mm. Bridge P90 recess 38mm. Guitars Electric co uk. Regards, Les & Pat at Guitars Electric. Professionally reliced, and has a high standard of finish. Découpes pour P90. Pont P90 38mm creux. Toute commande d'une valeur de plus internation £ 25 ne sera envoyé par le service chenilles Internation pour la sécurité. Nous ne laissez pas la rétroaction pour vous, lorsque vous avez quitté une expérience positive pour nous. The discolouration colour is very accurate for that aged look and is not over done. It achieves nothing. Overall length from 'Dog Ear' ends 118mm. Die Marching-Abteilung bei music world hat es ebenfalls in sich. Gibson P-90 / P-100 Pickup Cover. Nickel P90 Dog-Ear Pickup Screws. Gibson USA Les Paul. Soapbar Ausführung. - Farbe: Schwarz. Gibson USA Les Paul. Black Dog-Ear P90 Pickup Screws. Gibson USA Les Paul. Gold P90 Dog-Ear Pickup Screws. AUF GEHTS ! LET'S PLAY ! BWB 3 Lagig ! P90 DOGEAR PG. This pickguard will not fit Epiphone®. für P90 DOGEAR. schwarz weiß schwarz. Sie erwerben das Pickguard, wie es im Text beschrieben wird!